If you are looking for safe plastics for your plastic water bottle, then this chart may help. Note: This information on safe plastic is not the same as you will find elsewhere on the web. In an attempt to provide the most up to date evidence based information, there are several differences than you will find in a general search. The volume of information prohibited including all the research at this time. 1) The best choice is to use no plastic if at all possible. 2)Avoid heating and cooking with any plastic. 3) Avoid storing foods in plastic where the plastic will get hot (like in your car on a hot day. 4) Don't reuse plastic once it has become dented, creased or crumpled in any way. If it is not perfect, recycle it. 5) Avoid using plastics for foods that have oil or fats. Some plastic chemicals seem to have an affinity for oils and fats. Although some of these plastics are considered safe, there is still risk, no matter how small. For years the plastic associations have been saying that plastics are safe. Then the news that Bisphenol A (BPA) is dangerous was like the shoe falling on the ceiling above us. What will be the next shoe to fall? Since it is impossible to totally eliminate plastic from our life, we can limit our exposure to the worse offenders. The most important thing we can do is take steps to help our body detoxify from any of the toxins we may ingest. This can best be done by boosting our intracellular glutathione. 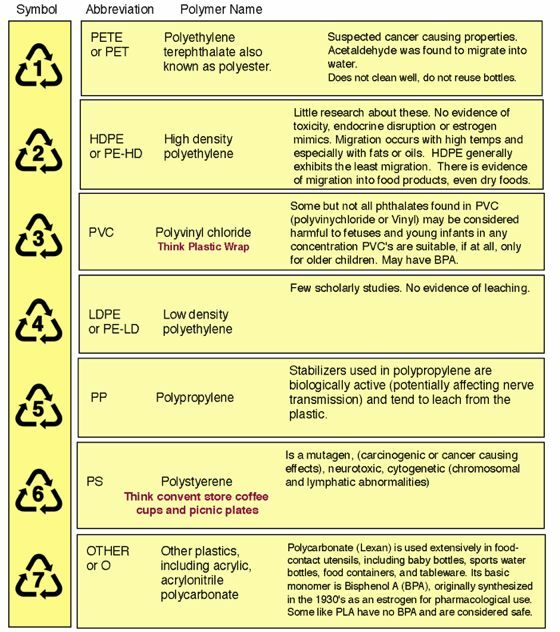 There are a few additional cautions to consider after the plastics graphic chart. This chart is based on the SPI resin categories and is to indicate resin content for recycling and sorting efforts. These codes were never intended to be, and are not, an indicator of product safety. Many websites will say that if a container is marked “7 or other, it should be avoided. While many in the 7 recycling plastic codes do have BPA, some superior to all above mentioned products may not. The 7 is the catch all designation and even newer and safer products will be included here. The health risks of cooking in plastic seem to include all forms of plastic according to literature. The worst offender is 6, polystyerene. A nemonic to help you remember which are considered the safest goes like this. Plastics number 4, 1, and 2 are safe for you. Notes many other resources say 5 is likewise safe. There is some evidence that it is not. Plastics Numbers 4 and 2 are the safest 1's for You! The safest plastic water bottle would be made of glass. Even there, high temperature glass is safer than regular glass bottles. Stainless steel comes in second. However, there is another concern here. There is industrial rated and food rated stainless steel. Many products made in other countries may not have the more expensive and safer food grade stainless steel. This can result in a leaching of some toxic heavy metals into the food. As stated above, since it is impossible to eliminate all toxins, even after doing the best we can, boosting our glutathione can help prevent any of the diseases processes that can result from ingestion of toxins. Word Of Caution: Some people reuse their plastic bottles. This increases the risk of the plastic leaching. If you do reuse bottles, make sure and clean them before use. They can harbor bacteria and mold. This is another reason to switch to glass bottles. Learn more about boosting the bodies master detoxifier regardless of how safe plastics may or may not be. How Can You Boost Your Glutathione?